The accuracy of remote sensing-based models of forest attributes could be improved by controlling the spatial registration of field and remote sensing data. We have demonstrated the potential of an algorithm matching plot-level field tree positions with lidar canopy height models and derived local maxima to achieve a precise registration automatically. 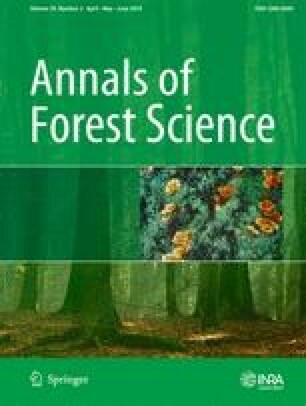 The accuracy of remote sensing-based estimates of forest parameters depends on the quality of the spatial registration of the training data. This study introduces an algorithm called RegisTree to correct field plot positions by matching a spatialized field tree height map with lidar canopy height models (CHMs). RegisTree is based on a point (field positions) to surface (CHM) adjustment approach modified to ensure that at least one field tree position corresponds to CHM local maxima. RegisTree has been validated with respect to positioning errors and the performance of lidar-derived estimation of plot volume. Overall, RegisTree enabled to register field plots surveyed in a range of forest conditions with a precision of 1.5 m (± 1.23 m), but a higher performance for conifer plots, and a limited efficiency in homogeneous stands, having similar heights. Improved plot positions were found to have a limited impact on volume predictions under the range of tested conditions, with a gain up to 1.3%. RegisTree could be used to improve the forest plot position from field surveys collected with low-grade GPS and to contribute to the development of processing chains of 3D remote sensing-based models of forest parameters. Contribution of the co-authors Cédric Vega conceived and designed the study. Maryem Fadili and Cédric Vega contributed to conception and coding of the method, data acquisition, processing, analysis and interpretation of the results, and drafting of the article. Jean-Pierre Renaud contributed to coding, data collection, and drafting of the article. Jérôme Bock contributed to data collection and proofreading of the article. The authors would like to thank the Office National des Forêt (ONF) for providing lidar and Field data for St-Gobain, Compiègne, and Darney. Maryem Fadili has been funded by the DIABOLO—Distributed, Integrated and Harmonised Forest Information for Bioeconomy Outlooks—project. This project has received funding from the European Union’s Horizon 2020 research and innovation program under grant agreement No. 633464 (project duration: 1 March 2015 to 28 February 2019; coordinator, Natural Resources Institute Finland (Luke)). Part of the data (Vosges, Aillon, Bure) has been acquired in the Framework of the project FORESEE funded by the French National Research Agency (ANR-2010-BIOE-008). ONF Département RDI and IGN Laboratory of Forest Inventory (LIF) are supported by the French National Research Agency (ANR) as part of the “Investissements d’Avenir” program (ANR-11-LABX-0002-01, Lab of Excellence ARBRE).